"Music is comprised of traditions, even when mixed with innovations," Gregory says, "so, of course, every musician is building upon sounds that came before. I admire and respect those jazz guitarists and I learned a lot from them." Lloyd started his solo career with the smooth jazz albums Wonderful in 1992 and Only For You in 1999. The third album Solo Guitar (2001) presented his acoustic guitar side performing jazz standards. With Free Fallin (2003) he returned to the smooth jazz style. 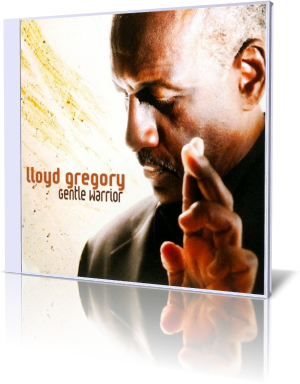 Gentle Warrior (2011) is Lloyd's fifth album and the first on Stanley Clarke's label Roxboro Entertainment Group. Brazilian Sea is the nucleus of fine and elegant music. With supreme perfection Lloyd Gregory invites us to a sound experience of superior art. To his exciting guitar chords Jeanie Tracy adds her silky vocals. Beyond musical skills we are always captivated by magic melodies and Germ has these certain notes, which initiate the wish for more. Although the current circumstances might be for Haiti the worst, one can imagine, the island has the inspiration for musicians like Gregory to expand their Caribbean dreams. The contemporary jazz piece Slither is Felton Pilate's child as writer, producer and engineer of this tune. Gregory remains the sizzling executer on the electric guitar. Peaceful and blithely comes Gentle Warrior, impressive to the extreme. Dream Of Love conjures the best in your relationship holding you in spellbound. When it's time to laid back, when you are in the mood for just let the wind breeze into your face, then listen to Stanley Clarke's Desert Wind. No affectation, just pure melodious mastership. Philly intertwines Indian sitar and Tablas with Western guitar to an irresistible flow. Fifteen years after the death of Princess Diana Gregory presents his tribute El Espiritu De Diana. With intense guitar performance he expresses his sympathy for the Princess of the hearts. A smell of Wes Montgomery is in the air, when Lloyd plays Remembering Carmel. Many things remind us of the impermanence of life. A Moment In Time is Lloyd's personal reflection. Short but deep. With captivating chords Gregory enjoys on Zulu Son Of Corba, his final commitment to the beauty of music. Lloyd Gregory's Gentle Warrior quickly impressed in my memory because of a sustained musical quality. Definitely will many others share my thoughts.